Give the gift of an evening full of great food and wine designed by you and your own personal chef! Gift Certificates are available for purchase with check or credit card via paypal. Our most popular Gift Certificate Packages are listed below, but every chef service is personalized, so if you have any questions, please email us here! 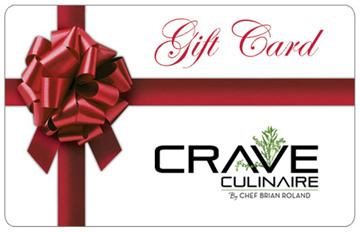 *For the remainder of the summer, Crave is offering a great Gift Card Promotion for all Small Business Owners. Learn more by clicking here.